SOURCE: National Health and Nutrition Examination Survey (NHANES), CDC/NCHS. NOTE: Data are for the proportion of adults aged 18 and over with diagnosed diabetes who had an HbA1c value less than 7 percent (objective D-5.2) and those who had an HbA1c value greater than 9 percent (objective D-5.1), and are age adjusted using the year 2000 standard population. 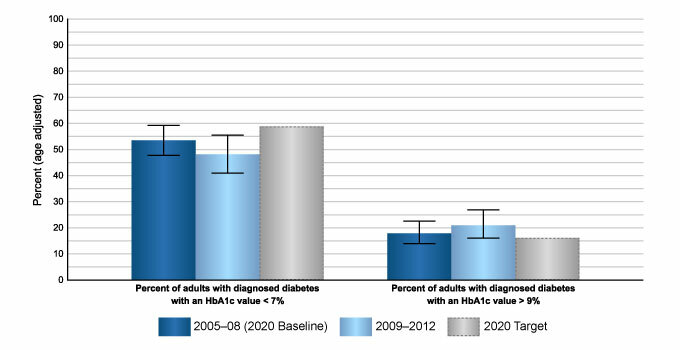 Between 2005–08 and 2009–12, the proportion of adults aged 18 and over with diagnosed diabetes who had an HbA1c value less than 7 percent (objective D-5.2) decreased 9.9%, from 53.5% to 48.2% (age adjusted), away from the Healthy People 2020 target of 58.9% (age adjusted), although this decrease was not statistically significant. On the other hand, the proportion of adults with diagnosed diabetes who had an HbA1c value greater than 9 percent (objective D-5.1) increased 17.3%, from 17.9% to 21.0% (age adjusted), away from the 2020 target of 16.1% (age adjusted), although this increase was not statistically significant.